In India, an “honest” government is that where only 50% of decisions get auctioned to the highest (illegal) bidder, while the rest get taken based on official perceptions of public need. A “crooked” government is where 70% of decisions get auctioned and only 30% get taken for reasons of perceived public interest. In Sonia Gandhi’s India, the estimate is that the central government auctions 90% of decisions,leaving only 10% to be decided on grounds of merit. M D Nalapat, Vice-Chair, Manipal Advanced Research Group, UNESCO Peace Chair & Professor of Geopolitics, Manipal University, Haryana State, India. Delhi is the nest of no fewer than six dozen international arms dealers, and they are the most desirable of friends to have in the national capital of what is effectively the world’s fourth-largest economy. Every week, each of them throws at least one if not more parties, at which liquor flows in the same profusion was water into bathtubs. The pot-bellied, ageing politicians and civil servants - now joined by a smattering of those in uniform - in attendance do not bring their wives along, for in such gatherings, there are numerous charming young ladies who attach themselves to the powerful attendees throughout the evening. What they whisper into the ancient, unsightly ears of the senior civil servants, select military brass and politician is not known, but whatever it be, the honeyed tone is effective. Contract after contract gets awarded in profusion to the lucky hosts, who are usually called upon to design tender specifications in such a way that only their chosen candidate will get selected. The name of the game is to frame the rules and the conditions in such a way that the rest of the pack gets eliminated Thus, in the selection of the $11 billion contract for the MMRCA (Medium Multi-role Combat Aircraft) ,the single-engined Saab Gripen was excluded “because it has a single engine and is therefore less safe than twin-engined aircraft”. The reality, of course, is that statistics show that twin-engined combat aircraft are no safer than those with single engines. Saab being bankrupt, the entire company could have been bought over for the price of the 126-aircraft deal, thereby enabling India to gain access to advanced technology as well as providing it with a platform that can enable Delhi to enter the field of sale of defense aircraft, the way China is already doing. In contrast, the Dassault Rafaele (which key circles in Delhi had told this columnist was the chosen craft, nine months before the selection was made public) involves no significant transfer of technology. The company remains French, and has indeed been saved from financial collapse by the huge Indian order, although no other country in the world has bought the Rafaele, save its captive market, France. Even the GCC countries, who are normally very obliging in such matters, have not touched the Rafaele, despite strenous efforts by the Sarkozy government to get them to buy the aircraft. However,the French President has succeeded in India, perhaps because of the persuasive abilities of his Italian-born wife Carla, who shares such roots with the all-powerful Congress President, Sonia (Maino) Gandhi France is indeed experiencing a bonanza from India. Not only has it managed to rescue Dassault through the MMRCA purchase (which flouts commonsense, because the Rafaele is comprehensively inferior to the fifth-generation aircraft being developed by China), but a total of more than $6 billion has been spent on purchasing French submarines, again vessels that are no match for the nuclear-powered vessels of the PLA Navy. Although there have been numerous corruption allegations against key French companies such as Thales, this has not prevented them from landing juicy contracts in India, a country where French women are much admired for their proficiency in aerobic exercises. As icing on the cake, in telecom as well as in the field of nuclear reactors, other French enterprises have landed, or are in the process of finalising, contracts worth several billion dollars each. The common link in all that is that the money for such expenditure comes from the Indian taxpayer. Clearly a case of the poor feeding the rich, in that India could have had a flourishing defense production industry, if its policymakers had not been determined to acquire only foreign platforms and systems. For more than three decades, successive governments have talked of “indigenisation”, but in 2012,more than 81% of critical defense equipment is sourced from foreign suppliers, even trucks, of which the private sector in India is an international supplier. You will find Tata or Leyland or Mahindra vehicles in much greater profusion in foreign countries than in the Indian military, which wears a distinctly foreign look. In the most expensive beauty parlours of Delhi or Mumbai, where an hour can cost more than $300, you can find the wives and daughters of not only politicians, officials and businesspersons (the usual suspects) but of senior military brass. Indeed, the lifestyles of some of the retired senior brass of the three services is such as would rival that of a prince, complete with multiple airconditioners and Audi and BMW cars littering the garages. Of course, nobody from the Income-tax department asks just how a retired military officer can afford such luxuries on his pension. For the record, they form “consultancy” companies. In common with the wives of senior officials and politicians, who earn huge “consultancy” fees without having knowledge of anything other kitty parties, the spouses of certain military officers have substantial income from companies that apparently pay them to go twice a week to the beauty parlour. The lifestyles of some retired super-senior military officers is clearly too opulent for them to have made the money they spend ethically, and yet no action gets taken against them. After all, they are just joining a very populous club, that of crooked officers and politicians, that include some of the biggest names in Delhi. Prime Minister Manmohan Singh has become a figure of fun in social media, with acerbic comments about his incapacity (if not unwillingness) to take action to stem graft. Another honest but ineffective individual is Defense Minister A K Antony, who presides over a ministry that is among the most corrupt in the country. Now they are under pressure, and all because of an honest officer who refused to go the way of some of his predecessors and amass wealth. The present Chief of Army Staff, General V K Singh, is a misfit in a post where there are so many opportunities for enrichment, and so much punishment in case one remains honest. He has gone public about being offered a $3 million bribe by a vehicle manufacturer, and has proof of the offer in the form of tapes. However, what is likely is that the CBI, the Central Bureau of Investigation ( more correctly known as the Congress Bureau of Intimidation) will doctor and destroy the tapes given to them, so as to enable well-connected fixers and lobbyists to escape. The CBI is unlikely to undertake a genuine probe into what may be called India’s Armsgate scam, for fear of angering politicians at the very top of national life. In India, an “honest” government is that where only 50% of decisions get auctioned to the highest (illegal) bidder, while the rest get taken based on official perceptions of public need. A “crooked” government is where 70% of decisions get auctioned and only 30% get taken for reasons of perceived public interest. In Sonia Gandhi’s India, the estimate is that the central government auctions 90% of decisions,leaving only 10% to be decided on grounds of merit. It is this intolerable spike in corruption that has finally roused a usually somnolent public to fury. Of course ,the arms merchants and their beneficiaries are fighting back, smearing the names of whistle-blowers and using the legal system to file frivolous and vexatious litigation to stop them from uncovering or reporting on graft. General Singh is under attack not only by the riuling parties but by the Opposition. After all, when they were in power, they too fed at the same filthy trough as those on the ruling side are now doing. However, the tide seems to be turning against them. One after the other, facts are tumbling out. By standing up against corruption in the Defense Ministry, General V K Singh is helping to make India more secure. —The writer is Vice-Chair, Manipal Advanced Research Group, UNESCO Peace Chair & Professor of Geopolitics, Manipal University, Haryana State, India. Are We Oppressed by Technology? Do we really need an iPad 3 after it seems as if iPad 2 was released only a few months ago? Was it absolutely necessary that Google give us Google+? Do phones really have to be “smart” when the old cell phones were just fine? For that matter, is it really necessary that everyone on the planet be instantly reachable by wireless videophone? The answer to each question is no. No innovation is absolutely necessary. In fact, the phone, flight, the internal combustion engine, electricity, the railroad — none of this is absolutely necessary. We could freely choose to live in a state of nature in which most children die in childbirth, those who do not live only a few decades and “medicine” amounts to sawing off limbs if you are lucky enough to have a tool that can accomplish the deed. It’s true that those people who bemoan the pace of technological development are not really longing for the state of nature. They are just sick of being hounded, badgered, hectored and pushed — as they see it — constantly to learn new things, acquire new gizmos, keep up-to-date and buy the latest thing. A survey from Underwriters Laboratories last year revealed that half of consumers “feel high-tech manufacturers bring new products to market faster than people need them.” There are many concerns such as privacy, safety, finances and the like, but mostly, I suspect that what’s behind the report is a more inchoate kind of unease. Learning new things can be uncomfortable. People sense that they were getting along just fine with the technology of the last few years, so why should they upgrade? They sense that always going for the new thing implicitly casts aspersions on our current or past lifestyles. We’ve all heard some version of this. So let’s be clear: There is nothing morally wrong with not adopting the latest thing. No one forces anyone to buy a smartphone, a fast computer, a fancier e-reader or whatever. There is no gun at anyone’s head. Technological upgrades are an extension of human volition — we can embrace them or not. And temperaments are different. Some people love the latest thing, while others resist it. There are early adopters, there are late adopters and there are refuseniks. I talked to a person the other day whose aging sister absolutely refuses to get a computer, an email address or a cellphone. Yes, such people do exist. When siblings want to contact her, they call or write a letter with a stamp. There is no sharing of photos, no video Skype, no keeping up with daily events. Everyone in the family is very close in the way that only digital technology allows, but this one person is the outlier, cut off from what everyone else experiences on a daily basis. I asked if she feels cut off. The answer: Yes, and she is very unhappy about it. She complains that people don’t travel long distances to see her enough. They don’t call enough. She is losing track of what is happening with the grandkids. She has a constant sense that she is just out of it, and this depresses her. Exactly. She is not actually happy with her choice. It’s just that making this choice seems easier than learning new things and buying new stuff. So she rationalizes her decisions as a principled stand against the digitization of the world. My experience is that these people have no idea the extent to which they inconvenience others. In fact, I would say that it comes close to being rude. It is not immoral, but it sure is annoying. Instead of dropping an email or posting on a Facebook wall or clicking a button on Skype, family members have to write out up their communications and stick them in an envelope and find a stamp and walk to a mailbox and wait a week or two or three to get an answer back. It’s all kind of crazy. People do it for a while, but then eventually find themselves annoyed and give up. Then the person on the other end gets angry and upset and feels ignored or cut off. This is their choice, too! It is a direct consequence of refusing to join the modern world. Then there are the late adopters who pride themselves in not glomming on to the new gadget. They imagine themselves to be above the fray, more wise and prudent than their fellows. There is a reason they are called “late.” They eventually come around. Those who resist new technology are cutting themselves off from the stream of life itself. True confession: I was once among the late adopters. I freely put down the techno enthusiasts. I wrote a highly negative review to Virginia Postrel’s provocative book The Future and Its Enemies, which turns out to have seen what I did not see. After the digital revolution advanced more and more, I began to notice something. By being a late adopter, I gained no advantage whatsoever. All it meant was that I paid a high price in the form of foregone opportunities. If something is highly useful tomorrow, chances are that it is highly useful today, too. It took me a long time to learn this lesson. Finally, I did, and my fears, excuses, rationalizations and strange anti-tech snobbery melted away. To really engage life to its fullest today means being willing to embrace the new without fear. It means realizing that we have more mental and emotional resources to take on new challenges. If we can marshal those and face these challenges with courage and conviction, we nearly always find that our lives become more fulfilling and happy. The biggest canard out there is that the digital age has reduced human contact. It has vastly expanded it. We can keep up with anyone anywhere. We make new friends in a fraction of the time. That sense of isolation that so many feel is evaporating by the day. Just think of it: We can move to a new region or country and find ourselves surrounded by communities of interest in a tiny fraction of the time it used to take us. As a result, digital media have made the world more social, more engaging, more connected with anything and everything than ever before. This isn’t a scary science fiction world in which the machines are running us; instead, the machines are serving us and permitting us to live better lives than were never before possible. Through technology, millions and billions have been liberated from a static state of existence and been granted a bright outlook and hope. In the 19th century, people loved technology. The World’s Fair was the glitziest and most wonderful thing that happened in the course of the decade. Everyone wanted to celebrate the entrepreneurs who made it happen. Everyone understood that technology that succeeds does so because we as people have chosen it and that we chose it for a reason: It fits in with our search for a better life. Perhaps that sense of optimism changed with the government’s push for the nuclear bomb. In World War II, we saw technology used for mass murder and ghastly accomplishment of human evil as never before seen in history. Then we went through almost 50 years in which the world was frozen in fear of the uses of technology. It wasn’t called the Cold War for nothing. When it finally ended, the world opened up and we could turn our energies again toward technology that serves, rather than kills, people. The real “peace dividend” you hold in your hand. It’s your smartphone. It’s your e-reader. It’s the movies you stream, the music you have discovered, the books you can read, the new friends you have, the amazing explosion of global prosperity that has visited us over the last 10 years. This is technology in the service of the welfare of humanity. In conclusion, no, we are not oppressed by technology. We can embrace it or not. When we do, we find that it brightens both the big picture and our own individual lives. It is not to bemoan, ever. The state of nature is nothing we should ever be tempted to long for. We are all very fortunate to be alive in our times. My suggestion: Try becoming an early adopter and see how your life improves. AS the Iranian nuclear issue appears to be heating up again, Indo-US strategic partnership has come under sharp focus. It is, therefore, pertinent to reflect upon the nature of the partnership between these two nations. Since this strategic partnership has been steadily growing for the last few years and, in President Obama's words, is set to be "one of the defining partnerships of the 21st century", every step taken by the two largest democracies is perceived with great expectations and is closely scrutinised. However, it may be suggested that the process of analysing Indo-US strategic partnership like any other partnership should be guided not only by expectations but also by the existing ground realities which really determine vision, policy formulations and practices. Only then can right conclusions be drawn and clear directions charted out for a brighter future. Since the base for Indo-US strategic partnership relies on a solid foundation of shared values and shared interests, the occasional misperceptions between the two partners may only be episodic. However, it is essential to understand and realise that both India and the US are faced with tough realities at their domestic as well as external regional fronts. These realities pose constraints and do influence foreign policy choices. Now it would be worth deliberating upon these realities in both countries. On the domestic front, India, despite the spectacular growth it has recorded in at least the last two decades, is still striving hard to successfully deal with challenges like poverty alleviation, providing attentive healthcare, nurturing a vast young population, ensuring energy security, building infrastructure, governance reforms, etc. These challenges may take some time to be overcome if efforts are made with excellent planning and for effective implementation. India is also a multi-religious, multi-cultural, multi-ethnic society. Thus, the world's largest democracy naturally will always pay utmost attention to the views and aspirations of its domestic constituency. It may be noted that it is the domestic constituency of a nation which ultimately determines foreign policy choices. The recent heated protest in Parliament and outside on the government's decision for allowing 51 per cent FDI in multi-brand retail in India, which led to its suspension, is one of the examples on how the domestic constituency determines any major policy decision. Earlier, India-Bangladesh Teesta water-sharing deal was put off due to protests by the ruling Trinamool Congress in West Bengal. Meanwhile, the protest by several Chief Ministers against the idea of establishing a counter-terrorism mechanism — the National Counter-Terrorism Centre (NCTC) — is yet another glaring instance which highlights how important it is for the government of the day to convince its domestic constituency on any policy move. Similarly, the US, which has severely suffered due to the worst financial crisis since the Great Depression in the 1930s, is dealing with pressing domestic challenges of job creation (the unemployment rate in the US was 8.3 per cent in January), controlling high budget deficit, putting its economy on growth path, etc. Now, to reduce budget deficit, the US government will have to implement the mandatory budget cuts over a period of the next 10 years which includes defence budget. In these challenging times, outsourcing of US jobs to India, China and other countries has been recurring as an electoral issue in US elections. As the process of the fresh US Presidential election is gaining momentum, the issue of outsourcing has once again come to the fore. In a speech on February 17, 2012, President Obama announced that "no company (in the US) should get a tax break for outsourcing jobs". These moves by leaders and policy makers may be aimed at pacifying the domestic constituency in the US, particularly young voters, who are facing hardships due to the gloomy employment scenario. It is evident that these domestic factors do appear as constraints in policy formulation processes for both strategic partners. On the regional front, it may be noted that India finds itself in a unique regional strategic environment. On its western side, it is faced with the gravest threat of terrorism emanating from Afghanistan and Pakistan. On its northern front, India faces probably the biggest challenge of our times — managing relations with a rising China with which India has some unresolved issues despite growing economic cooperation between the two. India is also surrounded by other neighbours which are relatively smaller in size but certainly not in importance. These neighbours have been facing their own internal challenges. India realises that to have a brighter strategic future, it is essential to have a dynamic and robust neighbourhood policy. In recent times, India has been proactively taking several initiatives to improve its relations with neighbours despite limitations in doing so. Now, the Iranian nuclear programme and the scenario of a conflict in the West Asian region has placed India in a tight spot. The fact remains that on the one hand India gets 12 per cent of its total crude oil imports from Iran, there are more than six million Indians working in West Asian and the Gulf region. India also depends on Iran for most of its equipment and construction material supplies to Afghanistan. On the other side, India's ties with the Israel are also of critical significance as Israel has emerged as the second largest defence equipment supplier to India. Since Indo-US strategic partnership is growing, Washington DC is expecting New Delhi to support its sanctions against Iran. However, it may be suggested that any Indian position on the Iranian issue needs to be guided by our own interests. It would be worth mentioning here that no government in India would attempt to take any such decision as might lead to risking the interests of its people. Any unrealistic step will surely be disapproved of by the domestic constituency. Similarly, the US is also facing a tough external environment. The US constantly remains cautious against the threats of terrorist attacks. After ending its combat operations in Iraq and recently in Libya, it is looking forward to ending its combat mission in Afghanistan by the end of 2014. To safely and successfully implement its proposed exit plan in Afghanistan, the US is looking for cooperation from regional countries. During her visit to India in July 2011, US Secretary of State Hillary Clinton stated in Chennai, "Reconciliation (in Afghanistan), achieving it, and maintaining it, will depend on the participation of all of Afghanistan's neighbours, including both Pakistan and India. We all need to be working together". A close look at these domestic and regional realities becomes essential for both strategic partners while cooperating and collaborating with each other. This deep understanding by the two sides with regard to expectations, realities, values, interests, opportunities as well as challenges is essential. It will help in reducing frictions and in evolving a clear strategy and vision for a brighter future. Finally, it may be noted that despite having shared values and shared interests because of the different state of domestic and regional environments, India and the US sometimes may appear to be taking different positions and postures on certain issues which should not be interpreted that they are working against each other. Cyberspace as an independent theatre of war is about attacks that compromise the capability to use these facilities: they cannot be prevented by the security services in isolation. The defence of cyberspace necessarily involves the forging of effective partnerships between the public organisations charged with ensuring the security of cyberspace and those who manage the use of this space by myriad users like government departments, banks, infrastructure, manufacturing and service enterprises and individual citizens.The defence of cyberspace has a special feature. The national territory or space that is being defended by the land, sea and air forces is well defined. Outer space and cyberspace are different. They are inherently international even from the perspective of national interest. This report argues that Government and the private sector give cyber security some priority in their security and risk management plans, and do this jointly. Being a report that is addressed to the security community in the widest sense and intended to stimulate public discussion, it relies on publicly available information. On March 12 a US drone strike in Waziristan killed 15 militants including two senior commanders of the Mullah Nazir faction of the Tehrik-e-Taliban. This was the ninth drone strike in 2012 and many more such strikes are expected in the coming weeks and months. 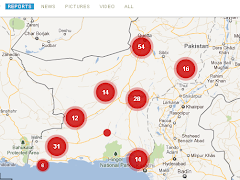 On March 20, the all-party parliamentary committee in Pakistan called for an end to US drone attacks as well as to “hot pursuit or boots” on Pakistani territory, declaring them as a violation of Pakistani sovereignty. The committee has also rejected the US offer of providing advance notice for drone attacks and limiting the types of likely targets. In fact, the idea of advance notice appears to be a desperate attempt by the US to avoid a total stoppage of its drone operations; hitherto, it has been highly secretive about its drone operations in order to prevent any last minute tip off to the militants by elements in the Pakistani intelligence establishment. Undoubtedly, the drones have heralded a new dawn in warfare: strike from a safe distance and with any troop commitment whatsoever. In fact, the global production of drones has reportedly risen and more and more states are inducting them into their inventory. A drone aircraft is a lethal piece of weaponry, which hovers overhead, unseen and unnoticed, and approaches its target silently and strikes with precision. It is a perfect device for surgical strikes. However, its increased use and success in the war on terror has sparked an international debate over the legality of its use and has raised three key questions: How lawful is this new form of warfare under international law? Are US drone strikes against terrorist groups a violation of Pakistan’s sovereignty? What rights and responsibilities do the injured state (the US or India) and host state (Pakistan) have should non-state actors (NSAs) continue to operate with impunity? At first glance it might appear that all is well with the Kingdom of Jordan. Under King Abdullah II ibn Al Hussein, Jordan has attained remarkable feats in the fields of economy, defence and diplomacy. The country’s annual growth rate stands at six per cent today and is set to rise higher as its famous special economic zone projects mature. The Kingdom has increased its defence capability with the acquisition of advanced weaponry. After Amman joined the United States-led forces in the second Gulf War in 2003, its relations with major Western powers as well as Gulf states have greatly improved. The King has also projected well his international image as a man of peace and harmony, attending several important summits with the United States, Israel and Palestine on the Arab-Israeli conflict and discussing with Pope Benedict XVI ways to promote values of tolerance and coexistence in the region. However, the reality on the ground is far different with the Kingdom becoming susceptible to the current waves of change blowing through the Middle East. Knowledgeable sources say that Jordan is being wracked by of chronic poverty and unemployment, rising energy and food inflation, acute water shortage, neglected human development and pseudo-democracy. The country’s official unemployment rate stands at 12 per cent, while the actual is estimated to be at least double that level. At six per cent, the inflation rate is hitting the masses hard. Progress on the democracy front has also been dismal. Reacting to the onset of the Arab Spring, in February 2012, King Abdullah outlined the goals of what he described as “self-transformation and progressive reform”. The goals include: “fair parliamentary elections, a law guaranteeing the broadest representation, a parliament based on political parties and governments drawn from that parliament.” However, nothing much has changed. The prime minister is still appointed by the king while the royal court and the intelligence services continue to call the shots. Further, the King’s non-seriousness in moving towards democracy can be discerned from an earlier speech he gave to parliament on October 26, 2011, in which he said, "As for governments formed by political parties, this issue rests in the hands of the citizens and voters, and it is very much conditional to the ability of political parties to freely compete." In other words, he would introduce a democratic system only after voters and political parties demonstrate the requisite maturity necessary for it. The King is hardly serious about ensuring freedom of expression as well. This can be discerned from his October 24, 2011 letter of designation to Prime Minister Awn al-Khasawneh, in which he stated: "the media should shun demagoguery and incitement, refrain from undermining the country's image and from character assassination… When democratic environment, press freedom, and freedom of speech are exploited to serve personal agendas and purposes, or to undermine the reform process or national unity, then this is a matter to be referred to the judiciary." In addition, the King’s lack of commitment to democracy is also clear given his inaction in addressing the continuing plight of the Palestinian-origin majority community (which obtained Jordanian citizenship when the Hashemite regime annexed the West Bank in 1948). Notwithstanding the ‘historic’ promise the King had made immediately after taking over from his father in 1999, they continue to endure the Kingdom’s discriminatory policies in all walks of national life. The East Bankers—Jordanians who inhabited the area before the arrival of the first Palestinian refugees in 1948—are the privileged lot in the country. Those of Palestinian-origin have had little share in the country’s political cake; they have been granted just six seats in the 120-member Parliament. Given the pattern shown by Islamist forces elsewhere in the region in the wake of the ‘Arab Spring’, they may well use the conditions of the masses in general and that of the Palestinians in particular to expand their influence and occupy the centre-stage in Jordanian politics. In order to counter such a possibility, King Abdullah has resorted to what the Islamists love the most—Israel-bashing. Notwithstanding the close relations, albeit often covert, that Jordan has established with Israel, the King recently accused Israel of having “continued to build settlements, particularly in Jerusalem” and posed “threats to holy sites.” He further noted that “Israel will have to choose between democracy and apartheid.” Besides, he has moved towards befriending the Turkish Prime Minister Recep Tayyip Erdogan and the Hamas leader Khaled Mashaal in order to win the sympathy of the Sunni Muslim masses. This motivation is also behind the King’s call (the first by an Arab leader) for the Syrian President to step down. But such tactics are highly unlikely to win over the Islamists or prevent them from seeking to overthrow the King. The ideology and activities of Jordan’s Muslim Brotherhood are well known. To Jordan’s Muslim Brotherhood head Hammam Saeed and its political arm the Islamic Action Front, the King, half-British and educated at Georgetown and Oxford, and his Queen Rania are too progressive to be “good Muslims” . They consider America as the greatest Satan on earth and the King as its stooge. They have been out to expose the King as a secret supporter of the West and Israel in the eyes of the masses. The Brotherhood may be calculating that its movement against the King today is likely to receive huge support particularly from the Palestinian refugees in Jordan. According to one estimate, in Jordan today, there are over 1.8 million registered Palestinian refugees. They have over the years been joined by 400,000 Palestinians from Kuwait, 700,000 from Iraq, Sudan and other parts of the region and now, in the wake of the ongoing Syrian uprising, over 81,000 Palestinians from Syria. Further, the movement against the King is likely to automatically gain support from Gaza-based Palestinian leaders such as Ismail Haniyeh and Mahmoud Zahar who are all under the influence of the ideology of the Brotherhood. Notwithstanding whatever Hamas leader Meshaal might have assured for tactical reasons to the King during his recent official visit to Jordan, what is likely to prevail finally on the former and his organisation is the temptation to have a government in Amman fully committed to the Hamas cause. Viewed against this background, the future of the Kingdom looks highly uncertain. For long, King Abdullah II has managed such challenges by playing the cards of social divides and external military support. This does not seem to be possible any longer. Even the East Bankers, who have historically stood like a rock behind the King’s regime, are a divided lot today. A section among them seems to think that the Kingdom’s new policies have resulted in a near collapse of the rural as well as public sectors wherein they have long been dominant. Some recent protests in the country show that a section of East Bank youths have even joined the growing movement for freedom and democracy. Abroad, the King is unlikely to gain support for quelling internal unrest with force. After all, this is an age of democracy, officially at least. The only way out for the King could perhaps be to commit himself genuinely to truly representative democracy and all-inclusive development. It remains to be seen if and how he takes a new path to remain relevant in his nation’s politics. The new AK-12 Kalashnikov assault rifle, which was unveiled in Russia in the middle of February, meets the requirements of Russian customers. Furthermore, the new rifle has good chances to succeed on the foreign market, the designers of the legendary weapon say. According to them, the new Kalashnikov proves that the maker of the rifle has changed its line of conduct and started listening to complaints. The 12th Kalashnikov, Izhmash officials said, has a number of features that make it different from the previous series of the rifle. The AK-12 may therefore become the basic model for future developments. "Nowadays, there is no point to produce arms only for military men. We are making a universal platform, and on the base of this platform we will be able to produce a variety of modifications. There will be a whole range of defense and civil products produced on the base of the AK-12. The Ministry for Interior Affairs and Defense Ministry have already evinced interest in the new rifle. We are negotiating the presentation of the product for the administration of the Russian defense department in April," Maksim Kuzyuk, the General Director of Izhmash, said in an interview with the Vedomosti newspaper. Izhmash officials said in the beginning of the year that it could be possible to design up to 20 different models of arms on the base of the AK-12. However, the head of the enterprise said that the engineers were busy with developing the design of future assault rifles. The new AK-12 has caused quite a commotion in Russia. Defense officials noted earlier that the new rifle did not differ much from the modifications of the AK-47. Therefore, the new rifle will have the same drawbacks which the prototype had. Officials with the Russian Defense Ministry stated that they were not going to order anything from Izhmash in 2012. The ministry described the requirements to small arms in 2010, but received nothing in return. Vice Prime Minister Dmitry Rogozin stated, though, that American specialists had acknowledged the advantages of the Russian rifle. Interior Ministry officials also said that they were satisfied with the new Kalashnikov. However, a number of military experts said that the AK-12 was far behind the fifth-generation category. Izhmash, the maker of the AK-12, is satisfied with its new product. The main reason for satisfaction is the usage of the Picatinny rail that gives an opportunity to enhance the basic model with auxiliary equipment, such as sights, rangefinders, grenade launchers and so on. "To a certain extent, Defense Ministry officials are right when they say that Izhmash does not have any new products. We realize that, so our new team set a goal to make a new assault rifle. We studied the advantages of the defense ministry, special services, as well as the range of automatic weapons that we have now. We found optimal solutions for a number of problems during our work. In the new AK, we managed to provide wide opportunities for mounting additional devices and to considerably improve ergonomics," Kuzyuk said. The above-mentioned Picatinny rails will be used for the production of other weapons. They will allow Izhmash to make the products that meet customers' requirements, the general director of the company pointed out. He also emphasized that Russian assault rifles still remained the most reliable rifles in the world. However, it did not help the company win a number of large tenders. QUETTA - Chief Justice of Pakistan Justice Iftikhar Muhammad Chaudhry has said that Balochistan is burning while the issue of missing persons and recovery of dead bodies is generating hatred, which is not good, both for the country and the province. The chief justice passed these remarks while heading a three-member Supreme Court bench while hearing a case on the deteriorating law and order situation in Balochistan on Tuesday. The other members of bench are Justice Khilji Arif Hussain and Justice Tariq Pervez. The government told the court that no FIR was registered regarding the recovery of bodies. Chief Justice Iftikhar Muhammad Chaudhry and Justice Tariq Pervez asked the home secretary to take bold steps for restoring public order. “You senior officials have failed to enforce Article 49. The situation would have been better if there was sincerity and will on the part of senior officials like the home secretary, inspector general police and intelligence agencies,” he said. During the hearing, the Balochistan advocate general submitted a report on the steps taken to improve law and order situation and measures taken to protect people in the province. However, the chief justice expressed dissatisfaction as the report says the law and order situation is improving. “Such reports are being presented to befool us. I do not see the writ of the government in Balochistan where people are forced to migrate. I am not talking about settlers alone. There were non-settlers, including Balochs and other ethnic groups, who have migrated from the province due to deteriorating law and order situation,” the chief justice observed. Advocate General Amanullah Kanrani informed the bench that around 80 people were kidnapped from different parts of Balochistan. “It is on the record that the home minister told media the provincial ministers are involved in kidnappings, then why action was not taken against such ministers or why they have not been arrested yet,” the chief justice questioned the IGP and home secretary. Justice Iftikhar asked the advocate general to give district-wise details number of missing persons and whether any case had been taken up. The home secretary said a special sell was set up at the Home Department and merely 152 families of missing persons lodged their complaints. “The government managed to recover 47 missing persons from different areas of Balochistan while 17 were found shot dead,” he told the bench. He further said 41 families could not provide the basic information about their missing relatives after which their cases were withdrawn. The home secretary said some recovered missing persons were under interrogation by different government functionaries and recovered by the provincial government. Chief Secretary Yaqoob Babar Fateh Mohammad told the bench that he had grave concerns over the recovery of bullet-riddled bodies and the issue of missing persons in Balochistan. He sought an opportunity to raise the issue with the security agencies. The chief justice said he would give a thorough judgment on the law and order situation but the government must name a responsible person to ensure the implementation of the court verdict. “The person must be on such a position that has the power to implement our verdict,” he said. The court observed that the democratic government should give peace to masses. Justice Tariq Pervez said “There are pictures in newspapers about meetings in Balochistan but there is no Baloch in these meetings,” he said, adding that they had come to Quetta to meet Balochs and Pashtuns. Balochistan High Court Bar Association President Zahoor Shawani said over 4,500 people had gone missing from Balochistan and the report submitted by the government was incomplete. The chief justice said there was complete absence of governance in the province. He noted that people were being killed in Karachi because the court orders were not implemented there. He said the court had ordered depoliticising the police, de-weaponisation and ending of no-go areas in Karachi but these orders were not implemented. “The time should not come that we ask some other people to implement our orders about Karachi,” he remarked. 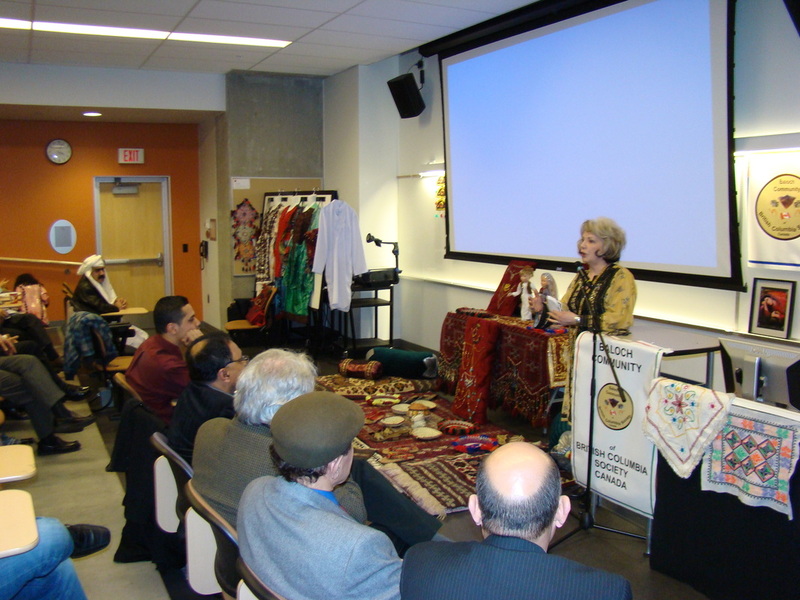 Baloch community of British Columbia and Baloch Community of Seattle together held a successful cultural event at Simon Fraser University in Surrey, British Columbia, Canada on Saturday March 31st 2012 with distingusihed speakers and display of Baloch arts the event had much to offer. Honorable Member of the Legislative Assembly, Sue Hammell representing Green Timbers Surrey, has done great work with Middle Eastern political parties was present on this afternoon. Honorable Sue Hammell reminded the audience Canada is country built from immigrants around the world. She explained her own parent’s decades ago moved for a better economic opportunity to Canada. Honorable Sue Hammell, took a keen interest about Baloch women’s embroidery works, Balochistan landscape and its historical places. Honorable Sue Hammell said during her next upcoming Legislative session in parliament she is going to talk about the Baloch people and their culture. Honorable Jinny Sims, Member of Parliament although despite not present at the event, sent her message,delivered by her constituency office staff member Nusrat Hussein. Honorable, Jinny Sims, a progressive Canadian politician, former president of the British Columbia teacher federation presented a Certificate of Recognition to the Baloch Community; Aziz Baloch recognized the honor for the Baloch Community of British Columbia Society and was deeply appreciative of honorable Jinny Sims message. It is an honor and a privilege for me to congratulate you on the inauguration of First Baloch Organization in Surrey, Canada. Community organizations are formed by dedicated people with great vision of serving the community. Community work requires hundreds of volunteer hours and by forming this organization you have displayed the desire of investing your time in the service of the community. Canada is land of immigrants, and we celebrate our diversity. As Canadian we must continue to work together to ensure that Canada remains an inclusive society and we regain our place in the international arena by having a progressive foreign policy. I commit to you that I will continue to be strong advocate for our community and for Canada. I would like to thank Mr. Aziz Baloch – and the entire executive board for inviting me. I am unable to attend because of the parliamentary duties, but you will be in my thoughts. I wish you all the best in the coming days. Dr. Derryl MacLean, founding Director of the Centre for the Comparative Study of Muslim Societies and Cultures, and associate professor in the Department of History at Simon Fraser University, provided a very in depth and insightful talk covering topics of Baloch poetry and literature. A social historian of religion, trained at the Institute for the Advanced Study of History at Aligarh Muslim University and the Institute of Islamic Studies at McGill University. It is exciting news for Baloch Community of British Columbia to know he is doing research about the Baloch Zikri. He made a presentation in the event in regards to Balochistan speaking of poets and historical moments that Baloch themselves might not have known. Mr. Kiumarce Nikraftar, a member of the Iranian writers from British Columbia made a wonderful speech speaking with an analogy of Baloch and Kurd nation. Executive Director of Simon Fraser Peace Valley; Shehzad Khan Nazer (Buzdar) and Ismail Rajput, as representatives of Pakistani progressive community both spoke in the event and gave their full support to the Baloch community. Their support was greatly appreciated and displayed the cooperation that can hopefully be duplicated on a much larger scale. Aeyshia Baloch, as Board of Director of Baloch Community of British Columbia Society, shed light of on the role of Baloch women in society. She also presented Balochi crafts and jewelry that really showed Baloch culture first hand. Persian artist, Reza Honari and his wife are making a great contribution to Balochi music. They lived in Balochistan and this family of artists have had their work aired on CBC and BBC Persian. His wife distributed their documentary which they made about Balochi music and arts to our distinguished guests at the event as support for the Baloch arts and culture. Baloch Community representative Aziz Baloch thanked all of the distinguished guests and the wonderful audience for their participation of the cultural event and made a brief speech about Baloch culture and customs. It was a significant first step to greater things that can come. It is important to carefully study the language of the notices issued by the US Justice Department announcing bounties of US $ 25 million for Ayman al-Zawahiri, the head of Al Qaeda, and US $ 10 million each for Mullah Mohammad Omar, the Amir of the Afghan Taliban, and Prof-Hafiz Mohammad Sayeed, the head of the Jamaat-ud-Dawa (JUD). 2.In the case of Zawahiri and Omar, the announcement says :" Wanted Zawahiri" and "Wanted: Omar". That means the reward is for anyone who will help in locating them and assist in their capture or elimination. 3.In the case of Sayeed, the announcement says:"Wanted information leading to the arrest and conviction of Sayeed." The reward has been announced in continuation of a Red Corner Notice issued by India through the Interpol for his arrest for prosecution in connection with the 26/11 terrorist strikes in Mumbai. 4.In the case of Zawahiri and Omar, the bounty is on their head. In the case of Sayeed, the bountry is not on his head. It is for information which would facilitate his arrest and conviction in the 26/11 terrorist strikes. 5.Pakistan has been claiming that India has not been able to provide any smoking gun evidence that could warrant the arrest and prosecution of Sayeed in connection with the 26/11 strikes. The US has announced a huge reward for anyone who will provide such information. 6.The question of the US undertaking an Abbottabad style operation to kill Sayeed does not arise.For that the US President has to record a finding that Sayeed poses a serious threat to US nationals and interests and authorise the CIA to undertake any operation against him even if that would involve his death.No such finding has been recorded by the US President in the case of Sayeed. “Now former National SecurityAdvisor, a decrepit Brajesh Mishra has been brought out of the dead cobwebs .Hetold Karan Thapar on TV that he held both the minister and the generalresponsible for not taking action on the bribery allegation but wanted Gen V KSingh to be sent on forced leave. "My view is that boththe minister and the Army chief are responsible for not taking action," hesaid commenting on the allegations by Gen Singh that he was offered a bribe ofRs 14 crore for clearing a contract for trucks and had informed the DefenseMinister about it. Asked whether the army chief should be sacked or sent on compulsory leave,Mishra told Karan Thapar on the Devil's Advocate programme that "If he issacked, then something more may happen. If he is sent on compulsory leave, heis not being sacked. He should be told that enjoy your two months vacation withgovernment salary and then take pension and go home." How very considerate buttrite of Mishraji .A former Indian diplomat Mishra was removed in 1980 asIndian Envoy from his New York post for not following the policy on Afghanistanof the newly elected India Gandhi got in1980.He was adopted by Washington and given a cushy job in UN . Son of formidable seniorCongress leader late DP Mishra, Brajesh soon came close to AB Vajpayee andbecame his evening companion. Power and publicity hungry, he was NationalSecurity Advisor and defacto PM as Principal Sec to PM Vajpayee .He tried torun MEA too. He was stopped from hogging publicity by his detractors in BJP.The job of Principal Sec to PM is rightfully for a senior IAS officer .Anexpert on multilateral diplomacy i.e. fighting over commas and full stops,Mishra had little experience or expertise in administration and finance .IASofficers in PMO ran circles around him, enriching themselves and letting theirfriends and patrons, India’s emerging robber barons loot the exchequer .Thiswas later described as India Shining era. The BJP was ousted from power .Howthe corporate robber barons thrived when Mishra was de facto PM needsinvestigation and a serious case study. But similar policies have continued. Karan Thapar’s TV interviewwas trite .It was pathetic and unbecoming performance by Mishraji brought outfrom the cobwebs to tarnish an upright and honest Army chief. Sometime ago Mishra hadrightly opposed the Indo-US Nuclear agreement , from which India has gainedlittle and lost very much .But Mishra soon changed sides merely to remain inlimelight and be on the US high table (dinner !). The idea of a so-calledtripartite US-Israel-India axis was mooted after the September 11,2001, attacks on the US and was publicly broached by India's nationalsecurity adviser, Brajesh Mishra, in Washington at the annual meeting ofthe American Jewish Committee, where many US congressmen were alsopresent. After emphasizing the similarities among the three countries, Mishra said:"India, the US and Israel has some fundamentalsimilarities. We are all democracies, sharing a common vision of pluralism,tolerance and equal opportunity. Stronger India-US relations and India-Israelrelations have [therefore] a natural logic." He then called for theestablishment of a US-Israel-India axis to fight "the menace of globalterrorism" by military means, i.e. "fight terror with terror". The proposal was warmly welcomed by US officials and the pro-Israeli lobby.Jews and Indian-Americans also came together in the US. Despite their obviousdifferences, the alliance in the US has the potential to increasethe clout of the two communities, which are about 5.2 million Jews and 1.8million Indians, but highly educated, affluent and attached to democratichomelands facing what they increasingly view as a common enemy. Ed Blanche wrote in Beirut's Daily Star on July 17, "In India, the demiseof the Hindu nationalist Bharatiya Janata Party government in parliamentaryelections in May was seen as a potentially major setback for Israel's plans forextending its influence into the subcontinent to help contain Pakistan'snuclear and ballistic missile programs and into the energy-rich Muslim republicsof Central Asia in conjunction with the Americans. The BJP had become a majorbuyer of Israeli arms and counter-intelligence expertise and had forgedunprecedented ties with the Jewish state. The new government under the Congressparty, which throughout the Cold War was staunchly pro-Arab and has said itwill take a more even-handed approach to the Middle East,is not expected to be so pro-Israel. The new government unveiled its policyroadmap on May 27, which said that India would remain committed to thecause of a Palestinian homeland and that new impetus would be given todiplomatic and economic relations with Arab states. "A recent scandal in India's premier intelligence agency, the Research andAnalysis Wing, in which a senior officer recruited by the US CentralIntelligence Agency (CIA) defected as security authorities closed in on him,has raised fears that the US and Israeli intelligence services have penetratedIndia's intelligence establishment. Asian intelligence sources told the DailyStar that Israel's Mossad,as well as the CIA, sought to recruit Indian intelligence operatives attendingseminars in Israelin recent years and apparently succeeded in some cases. All this is likely tofurther damage Israel-India relations. Below is an article on BC Mishra,which was published in 2009, but it exposes the pro-Zionist loudmouth. Amb (Retd) K.Gajendra SinghApril 3, 2012. Tel Aviv, Mishra was always inadequate, but did not lack cleverness. India-US-Israel compact at the strategic level in the post-911 days. case that these three countries must fight terrorism together. neo-conservatives with close ties to Israel’s ruling Likud Party. “mules,” and carbonized suitcases to ship their drugs to Europe. heralded the era of “smack, heroin, and brown sugar” in that region. that people of Kasol village in Kullu have learned to speak Hebrew! An Israeli revealed to Thakur some pertinent facts about the trade. controlled by drug cartels from Israel and Italy, Thakur said. the Italian and Israeli drug mafia through local residents. pointed out to him that the Indians are like Arabs. statements suspending the reality context and rapid motion activities. and bring back home some cold cash. and expand, undoubtedly he needs to answer them at the earliest. has its genesis at the very top. bad, Mishra does not have the wherewithal to get it. While marriage day might be the happiest day in the lives of many women, the preparations to that day are the hardest and organizationally very challenging. Meet Yebab.com. In the Arab world, you need to multiply all logistical and organizational challenges of a marriage by a factor of ten, in order to also account for cultural and religious matters. Despite, huge organizational challenges there are many young Arab women who marry annually, not least because Arabia is demographically the youngest region in the world. One survey conducted in 2008 by IIR Middle East during a Bride’s Show in Dubai revealed that 24% of brides in the UAE plan to spend up to US $140,000 on their wedding and 20% planned to spend even more. In 2008, despite the impact of the global recession, the average cost of a Dubai wedding was US $82,000. The wedding industry is estimated to cost around $500 million annually with over 8,000 Arab weddings taking place only in the UAE. In brief, there was a huge/growing demand to drastically simplify, streamline and save time/effort spent on preparing for a marriage and it was not met. Until 2008, Emirati women had to spend many months preparing for their weddings. Brides-to-be would need to look for and go through many local websites as well as go and visit shops, food caterers, etc. This was a challenging task taking lot of time and money. Then Yebab.com came around. “Yebab” is the loud celebratory whistle that Arab women make at weddings, expressing joy and happiness. Yebab is a free, wedding planning portal that is both in Arabic and English and offers a wide range of services. It provides brides-to-be with an extensive directory consisting of 22 categories and a list of shops that has gone from 30 in 2008 to over 1,400 in 2012. As Yebab was founded in UAE, it also offers services unique to the Emirati culture such as the wedding stage, cultural entertainment and wedding hospitality service. Yebab also offers administrative tools/methods on various ways of budget control. Murshed Mohamed Ahmed, founder of Yebab, identified one of important challenges, that of choosing a “preparation room.” This room is where a bride gets ready for her wedding, usually located in a hotel, marriage hall or a restaurant. With privacy and discretion being a priority for local brides, the location of this room and the walk they take to get to the main reception is often a high priority. Questions about preparation room are asked every time a bride contacts a hotel and is something the bride is keen to know about. But, according to Mr. Ahmed, many hotels and wedding planners usually don’t have comprehensive or even satisfactory answer to that question. Yebab’s solution to this particular problem is to film the preparation room and the walk from the room to the main event for each of vendors who offer their services via Yebab. The video shows what an image of a preparation room wouldn’t be able to show, and this proved very popular with brides. While Yebab is not the only one offering wedding related services in UAE (whiteme.net and dubaiwed.com), it is the only one in Arabic (in addition to English) and in less than 12 months after National Net Ventures invested in (August 2010) and incubated it, its traffic grew tenfold, tripled its pageviews, and doubled its revenue. Yebab.com is currently partnering with more than 130 wedding service providers. Since recently Yebab also started catering for the Saudi Arabian and Egyptian markets. It generates revenues based on partnerships (wedding services vendors paying a fee – starting at around $1,000 a year and rising according to the size and scope of the vendor – to have a dedicated page on the Yebab website) and ads displayed on its website. So did Mr. Musher find a success recipe in the Arab world? His pragmatic advice to any would-be entrepreneur is to solve a real-world problem, be ready for unexpected problems and difficulties; but be ready and optimistic to solve them! Israel is now entering its third strategic environment. The constant threat of state-on-state war defined the first, which lasted from the founding of the Jewish state until its peace treaty with Egypt. A secure periphery defined the second, which lasted until recently and focused on the Palestinian issue, Lebanon and the rise of radical Sunni Islamists. The rise of Iran as a regional power and the need to build international coalitions to contain it define the third. Israel's fundamental strategic problem is that its national security interests outstrip its national resources, whether industrial, geographic, demographic or economic. During the first phase, it was highly dependent on outside powers -- first the Soviet Union, then France and finally the United States -- in whose interest it was to provide material support to Israel. In the second phase, the threat lessened, leaving Israel relatively free to define its major issues, such as containing the Palestinians and attempting to pacify Lebanon. Its dependence on outside powers decreased, meaning it could disregard those powers from time to time. In the third phase, Israel's dependence on outside powers, particularly the United States, began increasing. With this increase, Israel's freedom for maneuver began declining. The Palestinian issue, of course, has existed since Israel's founding. By itself, this issue does not pose an existential threat to Israel, since the Palestinians cannot threaten the Israeli state's survival. The Palestinians have had the ability to impose a significant cost on the occupation of the West Bank and the containing of the Gaza Strip, however. They have forced the Israelis to control significant hostile populations with costly, ongoing operations and to pay political costs to countries Israel needs to manage its periphery and global interests. The split between Hamas and Fatah reduced the overall threat but raised the political costs. This became apparent during the winter of 2008-2009 during Operation Cast Lead in Gaza when Hamas, for its own reasons, chose to foment conflict with Israel. Israel's response to Hamas' actions cost the Jewish state support in Europe, Turkey and other places. Ideological or religious considerations aside, the occupation of the territories makes strategic sense in that if Israel withdraws, Hamas might become militarized to the point of threatening Israel with direct attack or artillery and rocket fire. Israel thus sees itself forced into an occupation that carries significant political costs in order to deal with a theoretical military threat. The threat is presently just theoretical, however, because of Israel's management of its strategic relations with its neighboring nation-states. Israel has based its management of its regional problem less on creating a balance of power in the region than on taking advantage of tensions among its neighbors to prevent them from creating a united military front against Israel. From 1948 until the 1970s, Lebanon refrained from engaging Israel. Meanwhile, Jordan's Hashemite regime had deep-seated tensions with the Palestinians, with Syria and with Nasserite Egypt. In spite of Israeli-Jordanian conflict in 1967, Jordan saw Israel as a guarantor of its national security. Following the 1973 war, Egypt signed a peace treaty with Israel that created a buffer zone in the Sinai Peninsula. By then, Lebanon had begun to shift its position, less because of any formal government policy and more because of the disintegration of the Lebanese state and the emergence of a Palestine Liberation Organization presence in southern Lebanon. Currently, with Syria in chaos, Jordan dependent on Israel and Egypt still maintaining the treaty with Israel despite recent Islamist political gains, only Lebanon poses a threat, and that threat is minor. The Palestinians therefore lack the political or military support to challenge Israel. This in turn has meant that other countries' alienation over Israeli policy toward the Palestinians has carried little risk. European countries opposed to Israeli policy are unlikely to take significant action. Because political opposition cannot translate into meaningful action, Israel can afford a higher level of aggressiveness toward the Palestinians. Thus, Israel's strongest interest is in maintaining divisions among its neighbors and maintaining their disinterest in engaging Israel. In different ways, unrest in Egypt and Syria and Iran's regional emergence pose a serious challenge to this strategy. Egypt is the ultimate threat to Israel. It has a huge population and, as it demonstrated in 1973, it is capable of mounting complex military operations. But to do what it did in 1973, Egypt needed an outside power with an interest in supplying Egypt with massive weaponry and other support. In 1973, that power was the Soviet Union, but the Egyptians reversed their alliance position to the U.S. camp following that war. Once their primary source of weaponry became the United States, using that weaponry depended heavily on U.S. supplies of spare parts and contractors. At this point, no foreign power would be capable of, or interested in, supporting the Egyptian military should Cairo experience regime change and a break with the United States. And a breach of the Israeli-Egyptian peace treaty alone would not generate a threat to Israel. The United States would act as a brake on Egyptian military capabilities, and no new source would step in. Even if a new source did emerge, it would take a generation for the Egyptians to become militarily effective using new weapon systems. In the long run, however, Egypt will remain Israel's problem. The near-term question is Syria's future. Israel had maintained a complex and not always transparent relationship with the Syrian government. In spite of formal hostilities, the two shared common interests in Lebanon. Israel did not want to manage Lebanon after Israeli failures in the 1980s, but it still wanted Lebanon -- and particularly Hezbollah -- managed. Syria wanted to control Lebanon for political and economic reasons and did not want Israel interfering there. An implicit accommodation was thus possible, one that didn't begin to unravel until the United States forced Syria out of Lebanon, freeing Hezbollah from Syrian controls and setting the stage for the 2006 war. Israel continued to view the Alawite regime in Syria as preferable to a radical Sunni regime. In the context of the U.S. presence in Iraq, the threat to Israel came from radical Sunni Islamists; Israel's interests lay with whoever opposed them. Today, with the United States out of Iraq and Iran a dominant influence there, the Israelis face a more complex choice. If the regime of President Bashar al Assad survives (with or without al Assad himself), Iran -- which is supplying weapons and advisers to Syria -- will wield much greater influence in Syria. In effect, this would create an Iranian sphere of influence running from western Afghanistan to Iraq, Syria and into Lebanon via Hezbollah. It would create a regional power. And an Iranian regional power would pose severe dangers to Israel. Accordingly, Israel has shifted its thinking from supporting the al Assad regime to wanting it to depart so that a Sunni government hostile to Iran but not dominated by radical Islamists could emerge. Here we reach the limits of Israeli power, because what happens in Syria is beyond Israel's control. Those who might influence the course of events in Syria apart from Iran include Saudi Arabia and Turkey. Both are being extremely cautious in their actions, however, and neither government is excessively sensitive to U.S. needs. Israel's main ally, the United States, has little influence in Syria, particularly given Russian and, to some extent, Chinese opposition to American efforts to shape Syria's future. Even more than Egypt, Syria is a present threat to Israel, not by itself but because it could bring a more distant power -- Iran -- to bear. As important, Syria could threaten the stability of the region by reshaping the politics of Lebanon or destabilizing Jordan. The only positive dimension for Israel is that Iran's military probably will not be able to deploy significant forces far from its borders for many years. Iran simply lacks the logistical or command capabilities for such an operation. But developing them is just a matter of time. Israel could, of course, launch a war in Syria. But the challenge of occupying Syria would dwarf the challenge Israel faces with the Palestinians. On the other side of the equation, an Iranian presence in Syria could reshape the West Bank in spite of Shiite-Sunni tensions. The United States and the Europeans, with Libya as a model, theoretically could step into managing Syria. But Libya was a seven-month war in a much less populous country. It is unlikely they would attempt this in Syria, and if they did, it would not be because Israel needed them to do so. And this points to Israel's core strategic weakness. In dealing with Syria and the emergent Iranian influence there, Israel is incapable of managing the situation by itself. It must have outside powers intervening on its behalf. And that intervention poses military and political challenges that Israel's patron, the United States, doesn't want to undertake. It is important to understand that Israel, after a long period in which it was able to manage its national security issues, is now re-entering the phase where it cannot do so without outside support. This is where its policy on the Palestinians begins to hurt, particularly in Europe, where intervention on behalf of Israeli interests would conflict with domestic European political forces. In the United States, where the Israeli-Palestinian problem has less impact, the appetite to intervene in yet another Muslim country is simply not there, particularly without European allies. This is all compounded by the question of Iranian nuclear weapons. In our view, as we have said, the Iranians are far closer to a controlled underground test than to a deliverable weapon. Israel's problem is that Iran appears on the verge of a strategic realignment in the region. The sense that Iran is an emerging nuclear power both enhances Iran's position and decreases anyone's appetite to do anything about it. Israel is practicing psychological warfare against Iran, but it still faces a serious problem: The more Iran consolidates its position in the Middle East and the closer it is to a weapon the more other countries outside the region will have to accommodate themselves to Iran. And this leaves Israel vulnerable. Israel cannot do much about Syria, but a successful attack on Iranian nuclear facilities could undermine Iranian credibility at a time when Israel badly needs to do just that. Here again, Israel faces its strategic problem. It might be able to carry out an effective strike against Iran, particularly if, as has been speculated, a country such as Azerbaijan provides facilities like airfields. However, even with such assistance, Israel's air force is relatively small, meaning there is no certainty of success. Nor could Israel strike without American knowledge and approval. The Americans will know about an Israeli strike by technical intelligence. Hiding such a strike from either the Americans or Russians would be difficult, compounding the danger to Israel. More important, Israel cannot strike Iran without U.S. permission because Israel cannot guarantee that the Iranians would not mine the Strait of Hormuz. Only the United States could hope to stop the Iranians from doing so, and the United States would need to initiate the conflict by taking out the Iranian mine-laying capability before the first Israeli strike. Given its dependence on the United States for managing its national security, the decision to attack would have to be taken jointly. An uncoordinated attack by Israel would be possible only if Israel were willing to be the cause of global economic chaos. Israel's strategic problem is that it must align its strategy with the United States and with anyone the United States regards as essential to its national security, such as the Saudis. But the United States has interests beyond Israel, so Israel is constantly entangled with its patron's multiplicity of interests. This limits its range of action as severely as its air force's constraints do. Since its peace treaty with Egypt, Israeli dependence on outsiders was limited. Israel could act on issues like settlements, for example, regardless of American views. That period is coming to an end, and with it the period in which Israel could afford to deviate from its patron. People frequently discuss any U.S.-Israeli rift in terms of personal relations between U.S. President Barack Obama and Israeli Prime Minister Benjamin Netanyahu, but this is mistaken. It is uncertainty in Egypt and Syria and the emergence of Iran that have created a new strategic reality for Israel. SUU KYI : WHAT NEXT? CO-OPTION OR INDEPENDENCE?